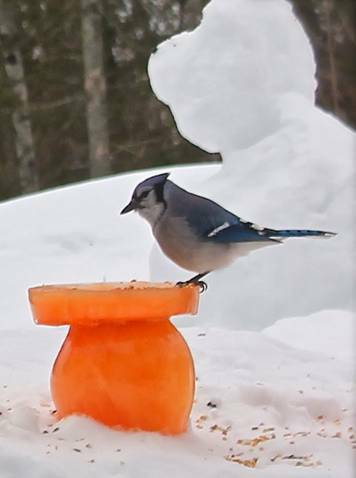 Bluejay enjoying the bounty from an ice sculpture bird feeder. 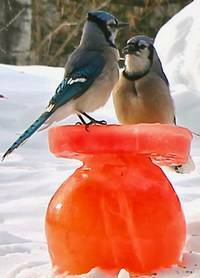 Here’s a bird feeder that money can’t buy – but what a colorful note of whimsy these ice sculpture bird feeders bring to a snow white garden. Not only do they attract the birds, they brighten the winter landscape in a way that draws the eye like a Monet. When I contacted Shanti from Twig and Toadstool about featuring this project, I found a fellow Canadian, making the best of the coldest winter that Canada has had in decades. That’s pretty cold. But what a beautiful bright spot she made of it. 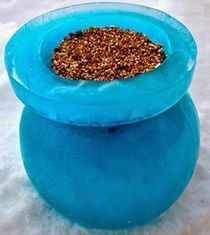 If you live in a similar climate, here’s how you can make colorful ice sculpture bird feeders for the pleasure of the birds, your family, and the entire neighbourhood. This is such a good idea, and so simple really, that I wouldn’t be surprised to see it catch on in a crazy way. Maybe a few years from now, we’ll see these bird feeders coloring every snowy front yard for everyone to enjoy. 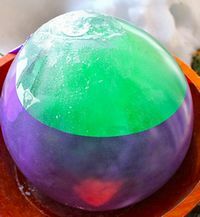 Take the food coloring and place a few drops (whatever color you want your ice orb) into each balloon. Next fill your balloons with water, place them in a bowl (to keep its rounded shape) and put it outside to freeze! If it is as cold where you are as where we are (-30!!) it should freeze completely overnight. Next day, unveil your ice orbs. Peel the balloons away from the colored ice to reveal the orbs completely. You’ll be smitten when you see them. But … how to make these pretty colored ice balls useful? 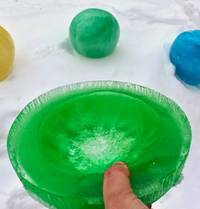 Take a leaf from Twig and Toadstool and learn how to continue this project by making colored ice bowls from cake tins to sit atop the colored orbs. Follow their tutorial and step-by-step pictures to see how to “melt” the two pieces together. You’ll end up with brightly colored bird feeders ready for use. Add bird seed and the wild birds will follow. Grab your camera and head outside for priceless photos of the birds coming to visit your winter feeders.